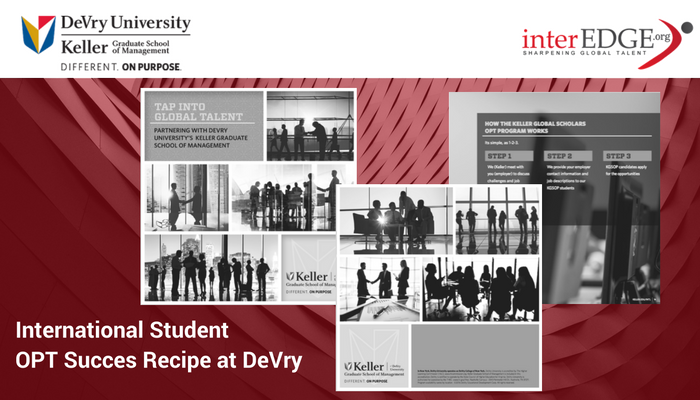 DeVry has been making a constant effort to support international students career success. After a pilot partnership earlier this year, DeVry and interEDGE finalized next phase of collaboration. Earlier this year, DeVry and interEDGe had partnered to offer a series of live virtual workshop on“OPTmizing Your Career Success with Cross-Cultural Skills” for its international students on multiple campuses across the country. Evaluations from the live poll assured us that the workshop was effective in bridging the knowledge and soft skills gap. Online survey and direct interaction with students reveal more about what support they need to build their career success. Devry responded with launching Global Scholars Program, “a quality match program tailored to companies in search of international talent.” It handpicks the brightest and highest performing international graduate students from its Keller Graduate School of Management by using criteria including high GPA, campus leadership experience, regional knowledge and expertise. Its first cohort includes students from Manhattan and Chicago Loop campuses, representing 12 countries, a wide range of professional experiences and different focus with their MBA. interEDGE will provide customized in-person workshops to support this cohort of selected students with their soft skills. Communication, networking, and navigating American hiring practice are among the top demanded topics. The first, “Launching OPT Success with Intercultural Competence,” will be offered on DeVry’s Manhattan campus with the live broadcasting on Chicago campus, enabled by DeVry’s technology-rich classrooms. DeVry is making bold and innovative efforts in enhancing its international student experience. interEDGE looks forward to continuing our partnership with DeVry team to support its international students.